Although we are probably all good at praying when we are in need or in want, sometimes we aren’t as good at giving thanks for what we have and what we receive. Expressing thanks for waking each morning with the opportunity to go to school, eat healthy meals and interact with friends is only the beginning. Allow the kids to itemize different things that they are thankful for and write them on the board while working on this art project. I’ve included boy and girl templates to print, but some classes may prefer hand drawing their own silhouettes. 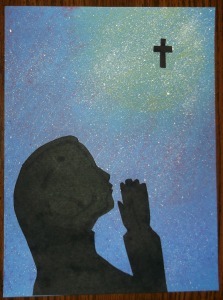 I’ve placed this project, “Bless Me, Lord” under the 5th Grade Projects Gallery in the sidebar. I believe that any class, that can cut carefully, can do this project. This entry was posted in 5th Grade, Categories and tagged 5th Grade, any class, art, art projects, art projects for kids, bless me lord, christian, christian art, Easter, for kids, giving thanks, praying, project, projects. Bookmark the permalink.